TREETIP: Did You Know About tRelational’s Schema Auto-Generation Feature? The Auto-generation function can be an extremely useful productivity aid. By simply invoking this function and specifying an Adabas file structure, a fully-functional corresponding RDBMS schema (Tables, Columns, Primary Keys, Foreign Key relationships and constraints) and appropriate mappings are created virtually instantaneously. The table and column names, datatypes, lengths, and mappings/transformations are all automatically tailored specifically for the RDBMS product, platform, and version–the user need not be an expert in the RDBMS. The auto-generated model can be immediately used to generate both RDBMS DDL and parameters for the Data Propagation System (DPS) component. 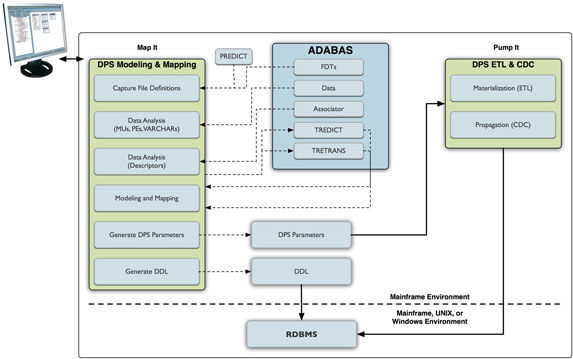 Within minutes of identifying the desired Adabas file or files to tRelational, the physical RDBMS schema can be implemented on the target platform and DPS can begin materializing and propagating data to load into the tables. It is important to note that these modeling options complement each other and can be used in combination to meet any requirements. Auto-generated schema elements can be completely customized “after the fact”, as can imported elements. 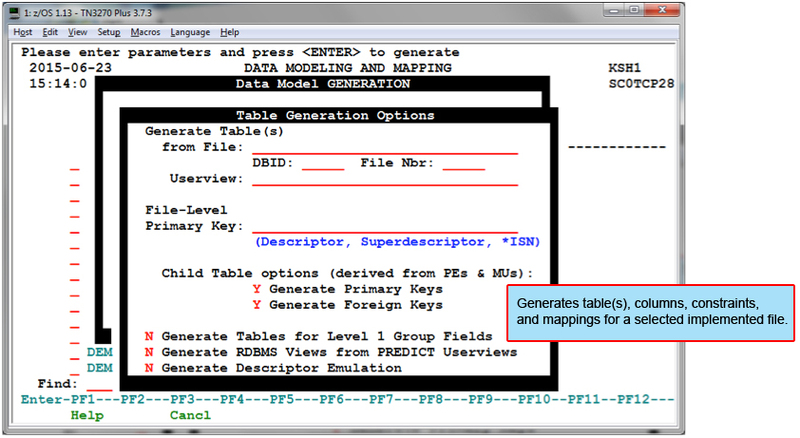 Auto-generation can be used at the file level to generate complete tables and table contents at the field level, making it easy to then manually define and map one or more columns within a table, or even to denormalize MU/PE structures into a set of discrete columns. This is the second in a series of blog posts concerning the Treehouse partnership with OpenLegacy (See Part 1 here). As discussed last time, OpenLegacy is a way to wrap legacy mainframe applications for presentation to Java, Web, and Mobile clients. We’ve already covered the conceptual workings of wrapping 3270 applications in general, so this time we’ll examine the first steps of wrapping an actual 3270 application in detail. 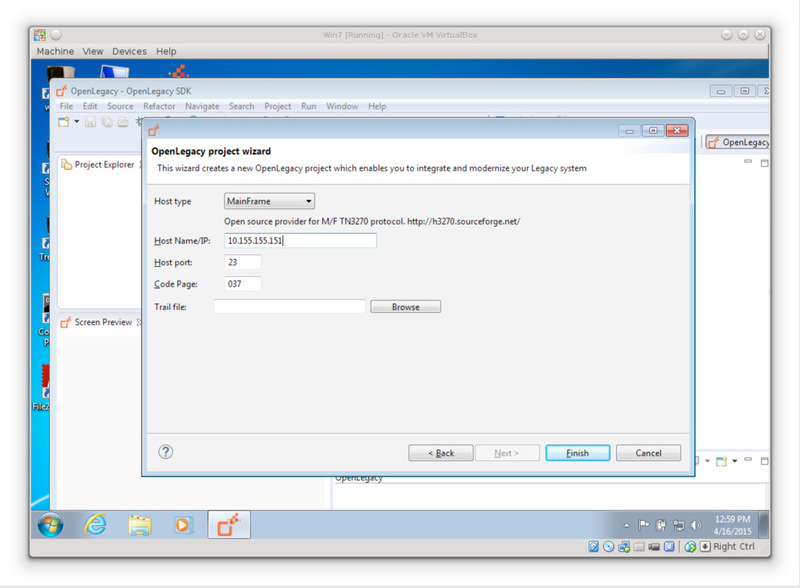 If you haven’t already downloaded OpenLegacy, you’ll need to do so in order to follow along in this Proof of Concept. Go to http://www.openlegacy.com and select Resources → Download. You’ll need to provide your name and an email address, which will get you a userid and password for the download site at ftp://ftp.openlegacy.org . CICS is one of the bulwarks of legacy 3270 applications. These days, it also supports a variety of other communications protocols, but for 3270 it acts very much like a Windows/DOS/Unix command line. You type a transaction name followed by optional arguments, and hit ENTER. 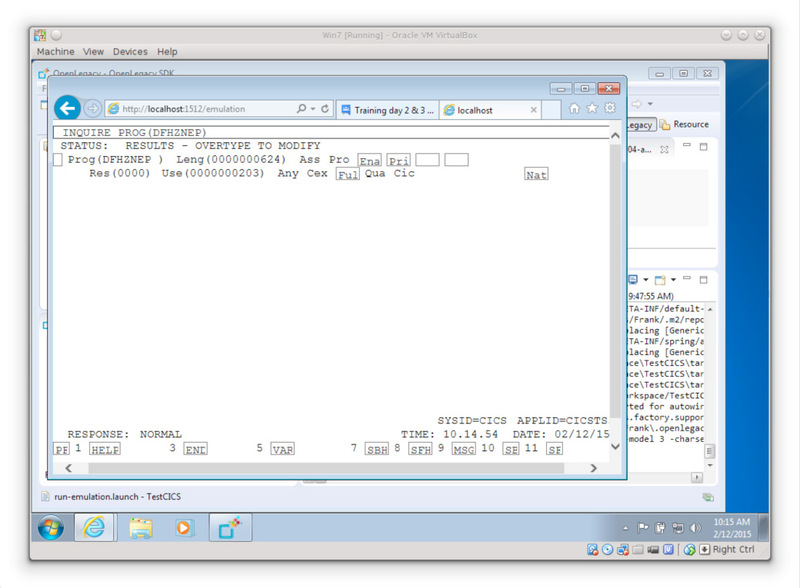 CICS looks up the transaction name in a table to find the application program associated with it, and runs that program. The program writes to the terminal, either in line mode or using formatted 3270 screens, and may request further input from the user and provide additional terminal output. CICS provides a number of utility transaction names with the product. We’ll be looking at two of them today: CESN (sign on to CICS as a known user), and CEMT (general multi-purpose transaction for querying and controlling aspects of CICS). We’ll construct a demo application by connecting to CICS, signing on with the CESN transaction and issuing the transaction CEMT INQUIRE PROG(xxxxxxxx) to obtain information about a specific CICS transaction program. The input to the application will be a userid, password, and application program name. The output will be some of the data associated with that program. Now, we need to run an emulation session to “teach” OpenLegacy how to navigate. 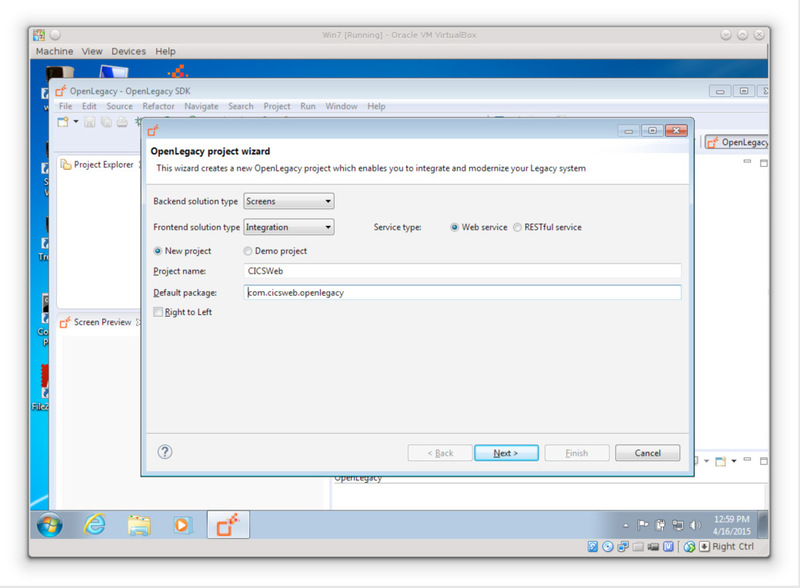 Right-click on the project and select OpenLegacy → run-emulation. This will set several things in motion. It will start an internal web server within the IDE on port 1512 and launch an instance of your default browser with a URL of http://localhost:1512. When the browser connects to the web server, it will execute a servlet that will use the open-source s3270 scripting emulator to connect to your mainframe and report the 3270 datastream to the servlet, which will convert the screen to HTML and send it to the browser. The CEMT transaction has displayed all sorts of information about the DFHZNEP program, which is what we wanted. At this point, we could continue with 3270 navigation to exit and signoff from CICS, but for simplicity in this example, we’ll just cut off the emulation here. This will cause OpenLegacy to disconnect the TN3270 session, which will cut us loose from CICS; if this were TSO, we’d have to follow through or risk leaving disconnected TSO sessions active. The trail file is an XML document which describes in detail your interactions with the mainframe. It will be the input to the next phase of generating the application, which will be the subject of the next post. Did you know that Treehouse Software offers online demonstrations of the most complete and flexible portfolio of solutions available anywhere for real-time, bidirectional data replication and integration between mainframe and LUW data sources? You can see how Treehouse Software’s popular tcACCESS and tcVISION products efficiently and cost-effectively use ETL, CDC, SQL, XML, and SOA technologies for data replication / integration, in an interactive demonstration with our skilled technical experts. tcACCESS is a comprehensive software solution that enables two-way integration between IBM mainframe systems and client/server, Web and SOA technologies — without the need for mainframe knowledge or programming effort. 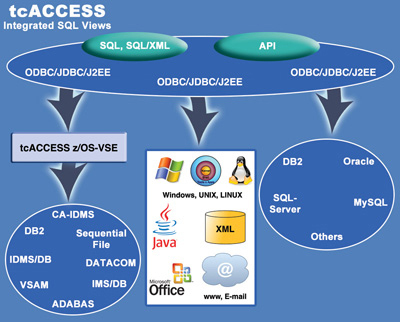 A proven platform that facilitates SQL-based integration of mainframe data sources and programs into LUW applications, tcACCESS uses industry standards such as SQL, ODBC, JDBC, and .NET. SQL queries to access mainframe data can be easily created using drag and drop techniques — no programming required. tcACCESS is a modular software solution. It consists of a base system that can either be implemented as a CICS transaction or as a VTAM application. The base system provides its own communication modules. 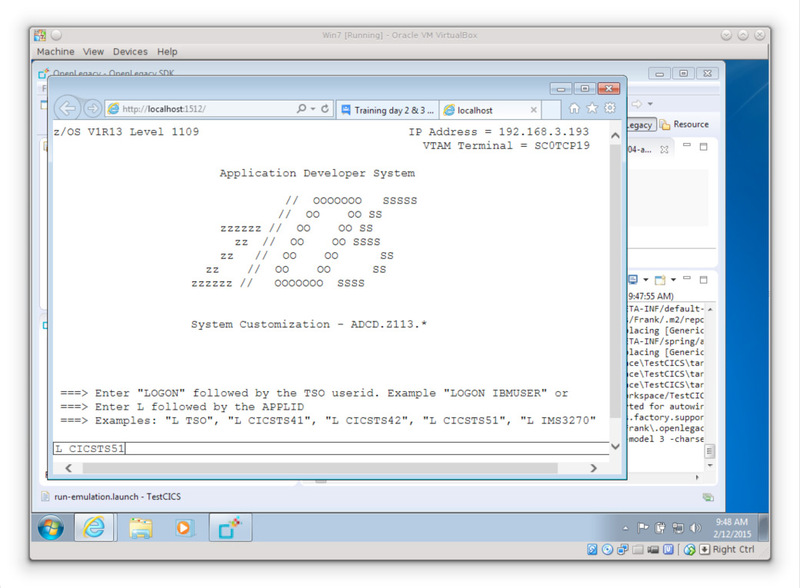 The heart of the system is the tcACCESS SQL Engine which allows access to mainframe data sources using SQL statements. tcACCESS offers Listener components on the mainframe and on the client, as well as scheduling and security functions. Batch processors automate the information exchange processes between distributed applications. tcVISION allows the exchange of data between heterogeneous databases, from legacy non-relational mainframe sources to standard RDBMSs, in batch or real-time, via CDC (change data capture). With tcVISION, complex replication scenarios can be implemented with ease–including bi-directional “master/master” replication requirements. tcVISION considerably simplifies mainframe data exchange processes. The structure of the existing mainframe data is analyzed by tcVISION processors, then automatically and natively mapped to the target. The data mapping information is presented in a user-friendly and transparent format – even for users with no mainframe knowledge. Tell us about your challenges. If you have a project where our mainframe data replication and integration products could be of assistance, our skilled sales and technical staff would be happy to set up a free, online demo. Simply fill out our short Treehouse Software Demo Request Form. Today’s IT organization is dealing with any number of challenges, including heterogeneous environments, legacy applications, high-availability information systems, data silos, increasing data volumes, and escalating costs. These factors make it imperative that IT departments find cost-effective solutions for enterprise-wide data management, preferably using intelligent data integration and efficient data synchronization. Data exchange in a heterogeneous IT infrastructure means harmonization of different data formats and data models for data exchange solutions. Very often, this data exchange is a complex and tedious task that represents a major cost factor. Data exchange is also time-sensitive and critical, hence reliability and auditability of all data movements is important. Since the mid-1990s, Treehouse Software has dominated the ADABAS-to-RDBMS data migration and integration market, with its proven and powerful ETL, CDC, and real-time replication solutions. The addition of two mainframe integration products: tcACCESS and tcVISION, enable the migration of virtually any mainframe database or data source in a cost-effective manner. 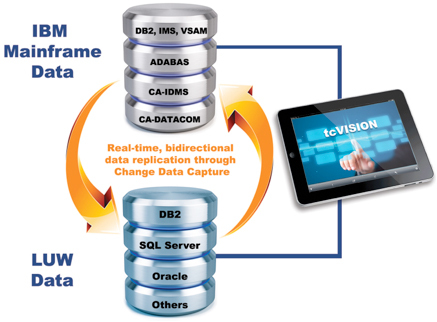 tcVISION supports data exchange between mainframe-based systems like IMS/DB and DB2, between mainframe and open-systems servers like DB2 and Oracle, as well as within an open-systems environment (e.g., DB2 LUW to SQL Server or Oracle). 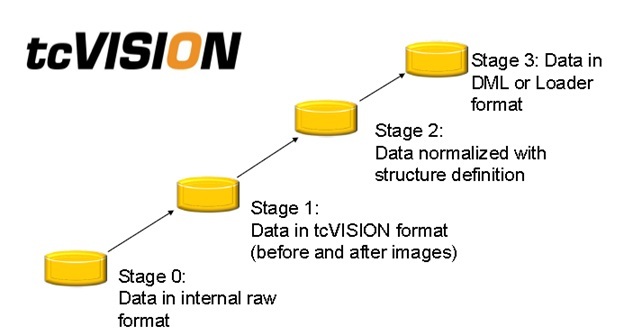 tcVISION’s unmatched array of CDC methods includes “Loopback Suppression” for bi-directional updates, ensuring data integrity and replication efficiency between the data sources and targets so that changes received from a source system and applied to the target are not unintentionally propagated back. tcVISION is a flexible data replication product that focuses on changed data from virtually any mainframe data source and transfers information between mainframe and workstations or open systems–in bulk, either through batch Changed Data Capture (CDC) or in real time. Mainframe data exchange processes are considerably simplified using tcVISION. The structure of the existing mainframe data is analyzed by special processors, and the data mapping information is presented in a user-friendly and transparent format – even for users with no mainframe knowledge–and captured in a metadata repository. tcVISION’s unique “stage processing” architecture allows for most (and in some cases ALL) of the ETL and CDC processing to be performed on a Windows, UNIX, or Linux platform. This is an especially attractive feature for sites that are already at 100% utilization of their mainframe CPU, or have a chargeback system in place. tcVISION’s Windows-based Control Board provides an easy-to-use facility to configure and administer the data flow. tcVISION provides a variety of interfaces to allow seamless integration with ETL or EAI solutions. Blum manufactures high-quality fittings systems for kitchens and home furnishings with production plants in Austria, Poland, Brazil and the USA. Their myriad replication challenges included continuous and bi-directional data replication between headquarters and subsidiaries, uni-directional replications between the mainframe and the Oracle Data Warehouse. To learn more about tcACCESS and tcVISION or read additional Case Studies here.